How do I allow students to like replies in a discussion? 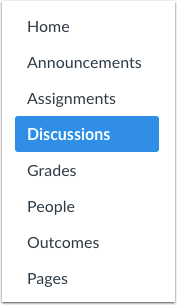 You can allow students to like replies in a discussion. If a discussion allows liking, users will see a Like icon within each discussion reply. By default, liking is available to all users in the course; however, you can choose to restrict the option to graders only. The Like icon is enabled on a per-discussion basis. Learn how to like a discussion reply. 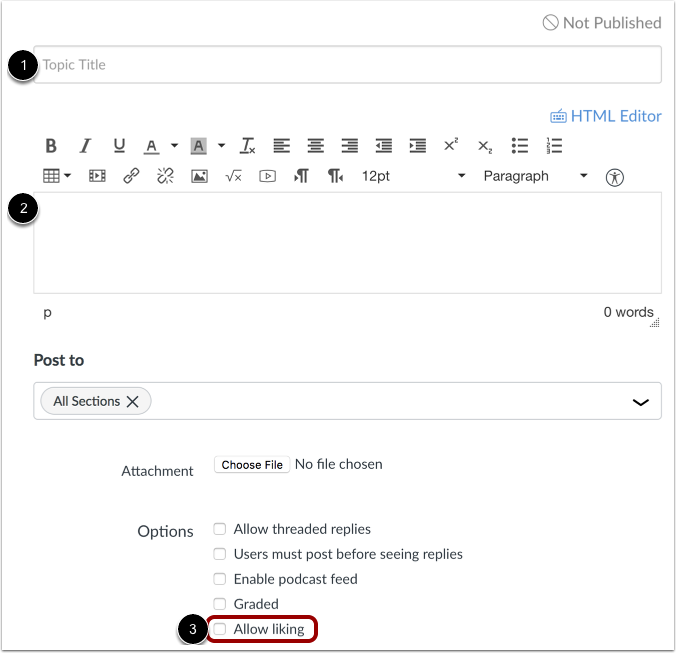 Use the Rich Content Editor to format your content. Allow liking by clicking the Allow liking checkbox. You can also select two additional options when allowing discussion likes. Only graders can like : select this checkbox if you want to limit the liking functionality to only graders in the course, which means only users with the Edit Grades permission can see the Like link. However, all users will still see the total number of likes for each reply. Sort by likes : select this checkbox if you want the discussion to sort replies by the number of likes. Sorting cannot be changed by any users unless you remove the sorting setting. This option may take at least 10 seconds to cache the page and view sorting appropriately. Discussion replies are sorted in descending order. In threaded discussions, replies retain the associated parent. For example, a new discussion may receive two replies. Then, Reply 1 gets individual replies a, b, and c, and Reply 2 gets individual reply d. If Reply 2 itself is liked, and reply b is liked, the discussion threads will be sorted first with Reply 2 (and reply d), then Reply 1 with reordered replies of b, a, and c.
Previous Topic:How do I allow students to create a course discussion? Next Topic:How do I allow students to attach files to a course discussion? Table of Contents > Discussions > How do I allow students to like replies in a discussion?